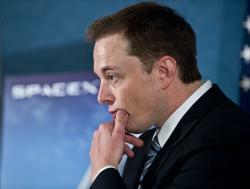 Elon Musk wants SpaceX to help establish a colony on Mars. At a small Future Tense gathering last night, Elon Musk—he of PayPal, Tesla Motors, and SpaceX—discussed the privatization of space travel and exploration with Robert Wright, host of “The Wright Show” on Slate. Musk explained the technology he envisions for SpaceX, like “full and rapid reusability” of spacecraft and methane as fuel; he also expressed his disappointment with the space industry’s post-Saturn V progress—or, rather, decline: “We take for granted that technology improves, but that’s not been the case” with space, he said. In January, Newt Gingrich’s space ambitions were mocked by many experts as well as the public, particularly his vow that a moon colony would be established by the conclusion of his “second term.” Musk isn’t committing to a timeline nearly so ambitious; when pushed by Wright, he suggested that this could be a reality within the next 30 years. The obvious question is: Why should public or private enterprise spend this much money on a venture that seems unnecessary in a time of austerity? Musk suggests that “making life multiplanetary” might be a worthwhile insurance policy for humanity. But it would also be “the grandest adventure … like, a really fun thing.” There will always be problems on Earth, he says, so if we wait for a better moment, it will likely never come.